At this point, it should be clear that eukaryotic cells have a more complex structure than do prokaryotic cells. 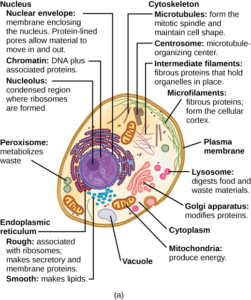 Organelles allow for various functions to occur in the cell at the same time. 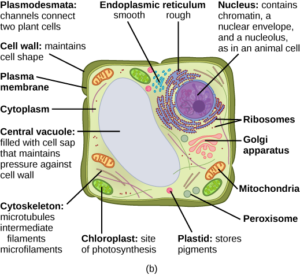 Before discussing the functions of organelles within a eukaryotic cell, let us first examine two important components of all cells (prokaryotic and eukaryotic): the plasma membrane and the cytoplasm. 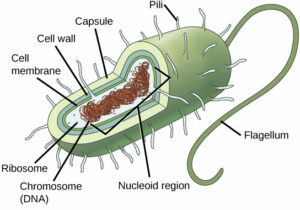 Figure 6 A prokaryotic cell. The cytoplasm is not labeled, but is the light blue area inside the cell membrane. The ribosome label is pointing to one of the small brown dots representing the ribosome. Figure 8 This figure shows a typical plant cell. Like prokaryotes, eukaryotic cells have a plasma membrane (Figure 9) made up of a phospholipid bilayer with embedded proteins that separates the internal contents of the cell from its surrounding environment. A phospholipid is a lipid molecule composed of two fatty acid chains, a glycerol backbone, and a phosphate group. The plasma membrane regulates the passage of some substances, such as organic molecules, ions, and water, preventing the passage of some to maintain internal conditions, while actively bringing in or removing others. Other compounds move passively across the membrane. Figure 9 The plasma membrane is a phospholipid bilayer with embedded proteins. There are other components, such as cholesterol and carbohydrates, which can be found in the membrane in addition to phospholipids and protein. The cytoplasm comprises the contents of a cell between the plasma membrane and the nuclear envelope (a structure to be discussed shortly). It is made up of organelles suspended in the gel-like cytosol, the cytoskeleton, and various chemicals (Figures 6, 7, and 8). Even though the cytoplasm consists of 70 to 80 percent water, it has a semi-solid consistency, which comes from the proteins within it. However, proteins are not the only organic molecules found in the cytoplasm. Glucose and other simple sugars, polysaccharides, amino acids, nucleic acids, fatty acids, and derivatives of glycerol are found there too. Ions of sodium, potassium, calcium, and many other elements are also dissolved in the cytoplasm. Many metabolic reactions, including protein synthesis, take place in the cytoplasm.